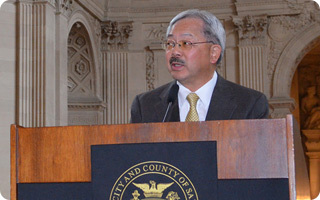 San Francisco Mayor Edwin M. Lee joined San Francisco Police Department Interim Police Chief Toney Chaplin and the Department of Public Health Director Barbara Garcia to announce that San Francisco will deploy licensed mental health professionals to the scene of police encounters with troubled individuals as part of a partnership between the Department of Public Health and the San Francisco Police Department. The new Crisis Intervention Specialists will support the de-escalation of conflict situations when police officers respond to individuals who may be mentally ill or under the influence of drugs or alcohol and pose a potential danger to themselves or others. The team will bring behavioral health expertise to critical incidents, support police at the scene, and assist with debriefing and crisis intervention trainings.